I was recently offered the opportunity to have a sneak preview at a previously unpublished letter by Christina Rossetti, which had been in the Samuel Looker archive acquired by the Richard Jefferies Society, and did a little bit of detective work! 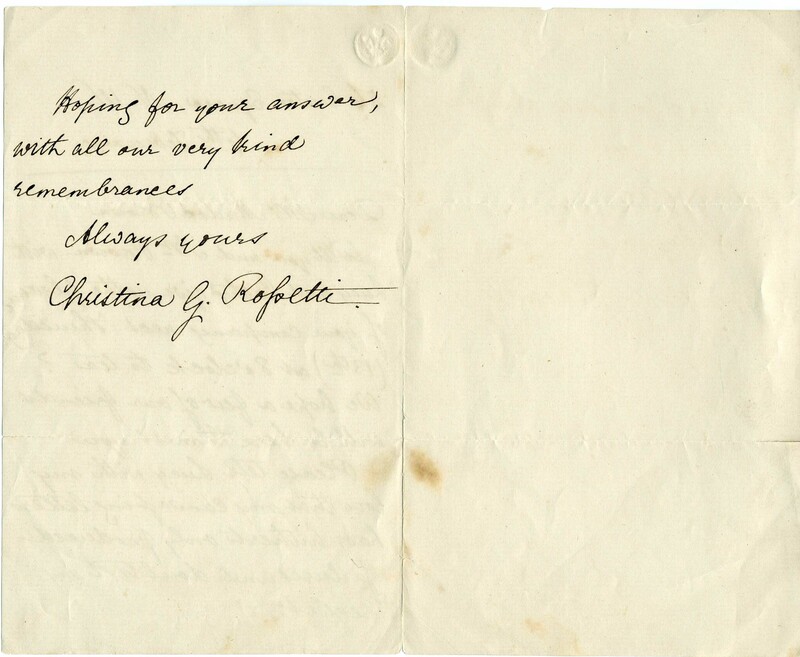 The letter is signed by Christina Rossetti and certainly appears to me to be authentic. The handwriting and signature are certainly hers; she was usually fairly formal in her letters and signed herself “Christina G. Rossetti” even to her family. The way in which her writing slopes off at the edge of the page is also characteristic, as is the tone of the letter. We hope that one or two of our friends will be with us on Thursday evening the 13th (8 o’clock), and proud and pleased we should be if you especially would accept the welcome and our cup of tea. The Rossettis’ acquaintance with Robert Browning was slight, but clearly sufficient for an invitation such as this to be issued. 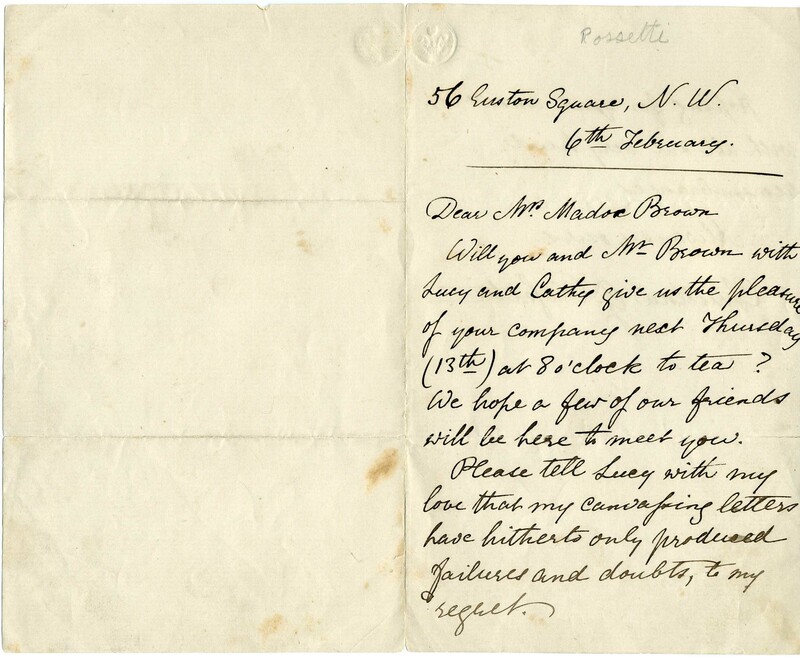 According to Jan Marsh’s biography, Christina Rossetti: A Literary Life, Browning did indeed visit the Rossettis early in 1868, so it seems probable that he accepted this invitation. The MS for the Browning letter is at Princeton, and Harrison glosses it, noting that Janet Camp Troxell, in her 1937 book Three Rossettis: Unpublished Letters to and from Dante Gabriel, Christina, William dates it to 1873, though Rossetti was then ‘too ill to be socialising’ (Harrison, p. 306). Philip Kelley, in his edition of the Brownings’ correspondence, dates it to 1868, which seems more likely. My Mother joins me in hoping that you will give us and a few of our friends the pleasure of your company to tea next Thursday (13th) at 8 o’clock. Henry Leifchild was a sculptor who exhibited regularly at the Royal Academy and was well-known to the Pre-Raphaelites. Clearly Rossetti was also on good terms with his sister, to whom the second letter is addressed. I would like to think that there are other letters out there, waiting to be found, inviting other people to the Rossetti soirée. We have no reason to suppose it did not go ahead. There is a letter to Miss Leifchild regretting her absence due to ill-health, but this does not seem to refer to the same event as it is marked ‘Tuesday’ and refers to ‘yesterday’. The letter, of course, is addressed to Mrs (Emma) Madox Brown and refers to her step-daughter, Lucy. Lucy and Christina were fairly friendly at the time, although Angela Thirlwell suggests in William and Lucy: The Other Rossettis that after Lucy’s marriage to William Michael Rossetti in 1874, their relationship was more polite than friendly. The reference to ‘canvassing letters’ is obscure. Rossetti was strongly anti-vivisectionist and also contributed to charities for children, the poor and disabled, yet there are no letters around this time which suggest she was in any way ‘canvassing’. Of course, Lucy was strongly pro-suffrage, an early feminist who signed petitions for the vote, but it is highly unlikely that Rossetti, who we know declined to sign such a petition, would have been canvassing for such a cause. A version of this article appeared in the Summer 2013 Review of the Pre-Raphaelite Society. With many thanks to The Richard Jefferies Society.